On Monday, June 12, Panama announced the establishment of diplomatic ties with the People’s Republic of China (China). The Republic of China (Taiwan) released a statement that same day severing ties with Panama and ceasing aid. Panama began diplomatic relations with the Republic of China in the 1920s and maintained this relationship following the government’s move to Taiwan. Panama had sought to establish ties with China in 2009, but China rejected the proposal in order to protect China and Taiwan’s growing diplomatic ties. As recently as December 2016 Panamanian officials reassured Taiwan of the “excellent condition” of the Panama-Taiwan relationship. Cooling relations between China and Taiwan, caused by the election of the pro-independence Tsai Ing-Wen, has led China to increase pressure on Taiwan’s few remaining allies to establish ties. China has also ceased communication channels with Taiwan, restricted tourism from China, and is preventing Taiwan from acting as an observer in UN agencies. Panama is the second country over the past year to break ties with Taiwan in favor of China. São Tomé and Príncipe broke diplomatic ties with Taiwan in December 2016 and established ties with China less than a week later. Both times Taiwan released an official statement expressing their “regret” over the breaking of ties. However, the statement reacting to the cessation of ties with Panama also expressed their “indignation” at Panama’s decision. According to Sean King at Park Strategies, “Panama has long been one of Taipei’s highest-profile diplomatic allies.” The breaking of ties has left Taiwan with only 20 official diplomatic allies. Panamanian business leaders and trade officials have reacted positively to the establishment of diplomatic ties with China. 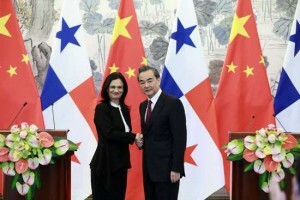 In 2016, Panama’s trade relationship with China was “roughly 12 times the value of the nation’s commerce with Taiwan.” President of Panama’s Trade, Industry and Agriculture Chamber, Inocencio Galindo, believes that the establishment of diplomatic ties with China will “result in more business and investment in Panama.” Octavio Vallarino, a partner of a Panamanian real estate firm, hopes Chinese investment will strengthen the commercial real estate market. Panama will now be able to more fully take advantage of their strong economic relationship with China. Some experts believe Panama’s switch in commitment may lead to more countries in Latin America breaking ties with Taiwan. According to Robert Manning, an Asia expert at the Atlantic Council, China has gradually been expanding its influence in Latin America and “pressure is likely to continue to rise on countries to switch sides.” As Chinese influence in Latin America expands, Taiwan’s wanes. Alvin Weeden, a former comptroller of Panama, believes this situation is a result of “a geopolitical reality” as “every day, Taiwan is more isolated.” Ross Feingold, at DC International Advisory in Taipei, believes “it is very possible that the remaining [Central American] countries will switch.” Taiwan’s remaining allies in Latin America have stayed quiet on this issue. The establishment of diplomatic ties between China and Panama is significant to U.S.-China relations because the Panamanian economy is intimately tied with the U.S. economy. Panama uses the American dollar and the U.S. is the largest customer of the Panama canal. The importance of the Panama Canal to Pacific-Atlantic trade is likely why China sought to formally establish ties. China’s increasing investment and involvement could challenge the United States’ strong trade ties in the region. This move also has the potential to affect regional politics as 11 of Taiwan’s remaining 20 allies are in Latin America. As China’s influence in the region grows, some may be swayed away by the benefits of Chinese trade.